Breaking up and replacing serviceable concrete slabs is wasteful. Instead, ask us about using polyurethane injection to raise sunken and cracked areas to their original position. When a concrete slab sinks, there are several approaches to re-leveling it. You can use a jackhammer to remove it and start over with new formwork, reinforcing mesh, and a fresh pour. You can re-level it by patching on a new, level layer of concrete. Or, you can lift it. 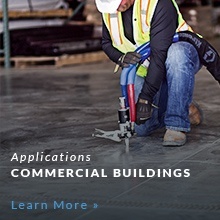 PolyLevel® technicians specialize in proven concrete lifting techniques that are unobtrusive and fast-acting. Contact your local dealer to schedule a free estimate! Our professionally trained contractors help families across the country with concrete leveling needs. Replacement is costly, disruptive, and messy. There’s a good chance your lawn and garden bed will not survive the onslaught of the cement mixer, wheelbarrows, piles of materials, compaction equipment, dust, and spillage – not to mention a sizeable crew. Patches to existing uneven concrete may hold if done with care, but what’s to stop the sidewalk (or driveway, patio, or pool deck, for that matter) from continuing to sink in the future? When lifting sunken concrete, the least disruptive and long-term solution available is the PolyLevel® system. 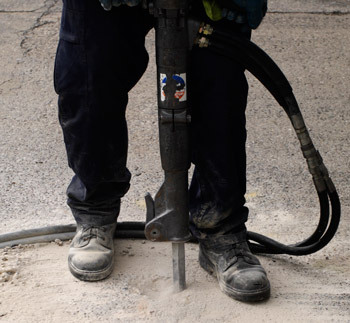 Polyurethane expanding foam is injected under the slab through small holes that are bored through the concrete surface. As the polymer expands, pressure on the underside of the slab gradually lifts the concrete to its original, level position. The polymer is mixed automatically at the nozzle and arrives in a self-contained unit, typically a trailer pulled by a truck. Often, a one-man crew can do the job. The cost of breaking up and disposing of the old concrete and replacing it with new is saved. Polyurethane foams conserve huge amounts of energy in their role as thermal insulators. They also are less polluting when it comes to making structural concrete repairs. The amount of energy and carbon emissions to demolish and dispose of old concrete, and to manufacture and transport new cement to the job site far surpasses that of injecting polyurethane foam into the ground. In addition, PolyLevel® formulations are inert and will not leach chemicals into the soil. Contact us if you are interested in restoring your concrete slab with PolyLevel® as opposed to other concrete leveling products. 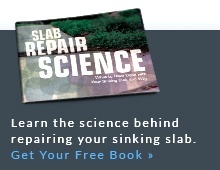 We offer Free Estimates for any concrete repair job using the PolyLevel® system.